It's 8.30 pm, it's dark, it's cold (at least for a Bay Arean like me -- it's a cloudless bone-chilling 7 degrees Celsius), we've got a very variable and gusty 30 knot headwind, the turbulence has been quite bad since before the IAF (COUPS intersection), NorCal has cleared us some time ago for the practice Sacramento Executive (KSAC) GPS RWY 2 approach, we've just passed the final approach fix (SAC VOR), I'm having a lot of trouble holding airspeed, heading, and altitude due to both the turbulence and my own death grip problem, the GPS 530 has suddenly announced that the approach (which had sequenced perfectly up to this point) is "not active", and suddenly the Executive tower controller seems to be asking me where we're flying today. I sit there under the Cone of Stupidity wondering why the hell is he asking me this? Is this a trick question? Is it some kind of intelligence test that I'm failing miserably? We're flying to Sacramento, dummy! Why do you think you just cleared us to land there?! A few seconds after this, as I try to interrogate John about what's going on with the GPS: "Uh, 4JG, did you say you wanted the circle-to-land for 20? I can give you the straight in for 2 if you'd like". At this stage I just throw up my metaphorical hands ("Dude, whatever...") and mumble something on air about taking the straight-in. "4JG, cleared for the option runway 2. Report going missed". OK, so I really wanted the circle-to-land for circling practice, but I'm already well on my way to losing it mentally -- the approach is steadily going to pieces as I concentrate too much on the radio and the GPS problem, and not on the flying. As I struggle to correct for some potentially serious-looking airspeed and heading deviations I tell John I'd go missed at this point in real life -- I'm just so far behind the plane and the approach it doesn't feel recoverable. He just says confidently "Keep going...", which I do. A few seconds later he tells me to look up -- and there it is, runway 2 in all its glory, sort-of straight ahead(ish). I land just fine (if a little long by my own standards -- there's an abrupt transition at a few hundred feet AGL from strong headwind to near-calm -- and a few seconds later we're off again on the missed. I have to admit that for a few seconds I have the suspicion that maybe John somehow organised this ahead of time with the tower controller. In any case, it's a good lesson in resource and bandwidth management, but right now I have to get back under the cone of stupidity and do the missed. We check in with NorCal at about 1,000' on heading 250, and the controller asks us what's next. "4JG, we'd like the GPS 25 into Rio Vista [O88], please. Pilot nav". After a short pause: "4JG, OK, where do you want to start the approach?". D'Oh! Where's the O88 plate? I'm already behind things again and we're still rocking and rolling in the turbulence miles from the next approach. This isn't going well. Then (with a bit of prompting from John) the light goes on! "Ah, NorCal, 4JG, standby..." (yes, finally I'm asserting some sort of control). No problem -- after a minute or so of setting up the plate and absorbing the information at my own pace, it's back to NorCal: "NorCal, 4JG, sorry about the delay, let's try for EPPES". "4JG, cleared for the approach". The major controversy from this point on is how to pronounce "EPPES". I say "Eppies". The controller later somewhat hesitantly uses "Eeppies". John uses "Eepps". The initial and intermediate approach segments go OK (given the turbulence and heavy crosswind), but once again, just at the FAF, the 530 tells us that the (properly-armed and activated) approach is suddenly "not active". John curses and tells me to continue flying the approach again and to ignore the problem (we'd done RAIM checks before departing Oakland, and we'd noted that the database was set to expire on January 20, so we assumed it wasn't either of those two problems; and there were no extant NOTAMs for GPS coverage or outages. When we reported the problem earlier to NorCal they'd sounded quite unconcerned). I struggle with the wind and the plane until John tells me to look up just before the MAP -- and there's the runway, a little to our left. We'll obviously have to circle, even though it's a straight-in approach, as we're way too high and fast for the straight-in. No problem, I think, but the next few minutes are a lesson in the realities of circling-to-land at night. Even VFR, I botch two attempts in a row to land -- the first time in literally years in a non-taildragger that I've had to go around because of something I've done rather than something someone else has done. It's mortifying -- twice I come in way too high and way too fast, mostly, I think, because I keep in too close each time around due to paranoia about breaking the 1.3 nm circling radius, and because with all the stress I just forget the basic VFR stuff (like S turns on final if you're too high, etc.). Added to this is the irritating fact that 4JG's flaps are seemingly ineffective -- the 30 degree full flap setting acts more like 10 or 20 degrees in any other C172 -- and the damn plane just floats along on landing. And the sometimes quite heavy turbulence in the pattern doesn't help, either. I'd hate to have to do this in real weather -- which is the whole point of the lesson (John clearly delayed my look-up long enough to force the circling). Third time around does the trick, and after a quick touch and go we do the missed (a dream with the 530...) and check back in with NorCal (who was probably starting to wonder where we'd gone after all the time in the pattern...). 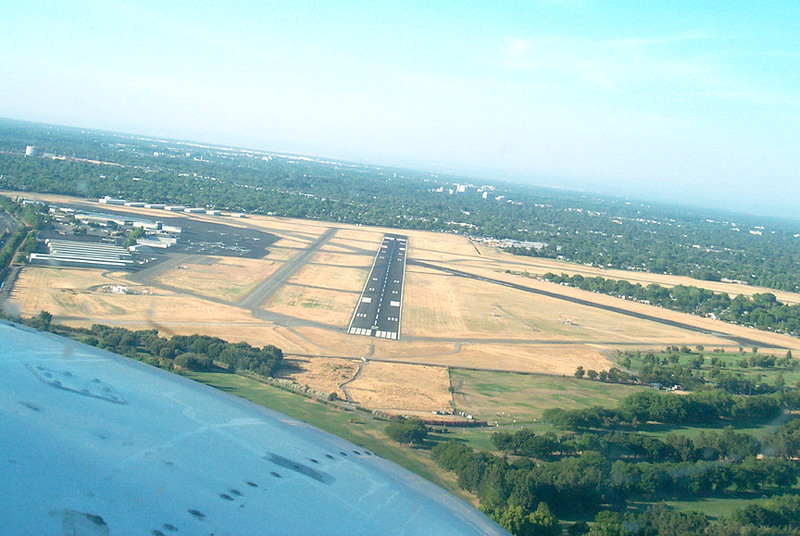 Once around the hold at OAKEY for the missed (with a strong 30-40 knot crosswind) and we depart VFR back to Oakland. 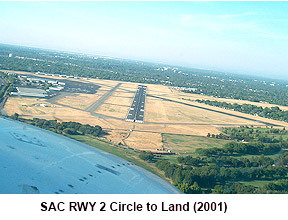 I take off the cone of stupidity and fly us back to Oakland VFR -- I'm exhausted, and it all looks so nice out there. So much has gone wrong tonight, and so much of what I did was done poorly, that I just have to relax and potter back without the stress. We spend some time playing with the GPS, when John has one of those Aha! moments -- Will, the plane's owner, had loaded in the new database from Jepp last night but it's not actually valid until tomorrow. So it won't go past the FAF without a warning. No big deal on the approaches we did since the approaches are identical to the old versions (I checked the plates before we departed); and, we're inside the FAF anyway and it's a clear night. The real question is why the 530 waits until the FAF to tell you that the approach you've previously activated isn't actually active. No warning, nothing. The major lessons from this evening seem to be the importance of the whole grace under pressure thing (again), and just how essential for a good approach it is to get the airspeed / trim equation down properly and repeatably (a lot of tonight's other altitude and heading roughness problems can be somewhat excused by the rather trying wind and turbulence). I may go out and just practice with 4JG on my own sometime next week to get the airspeed control better internalised. The other lesson, of course, is just how dangerous and difficult circling to land at night or in marginal weather can be. None of these lessons is new, but this evening's little adventure brought it all home again with more than the usual force. One of the good things about this evening is that even as everything seemed to be falling apart or I felt I'd just done something really badly, I actually thoroughly enjoyed the entire lesson. I didn't feel depressed or down about it all at all, which is part of the whole learning thing, I guess. Progress?